Because veneers are custom-fabricated in a professional dental lab, the first step to fabricating dental veneers is establishing the treatment goal between the patient, the dentist, and the laboratory technician. Once the goal is established the patient’s teeth are prepared. The removal of about approximately ½ millimeter of tooth structure from the front of each tooth is required to accommodate the thickness of the veneers. 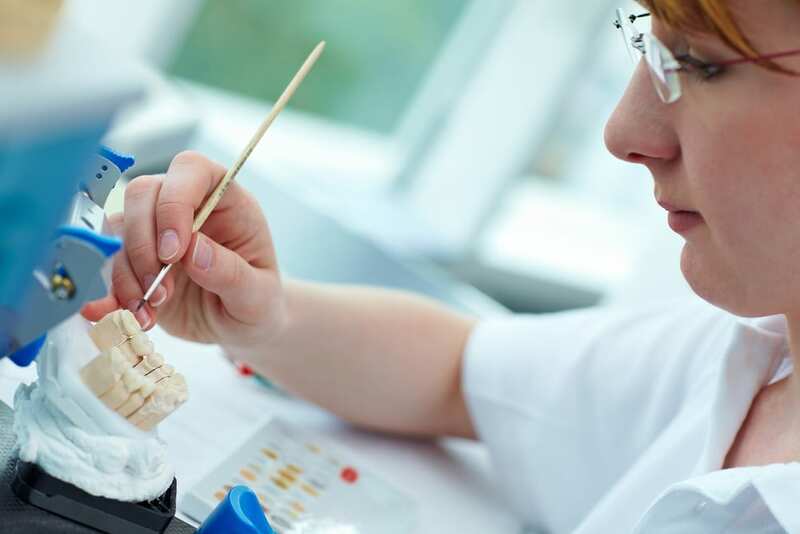 An impression is made of each prepared tooth then sent to the lab. When the impressions are at the lab they are used to fabricate the veneers. A zirconium coping is scanned into the computer. The scan of the model work is used to fabricate the framework for the porcelain veneer. Porcelain of different colors, chromas, and opacities are stored in bottles and chosen based on pictures and dental notes. The porcelain is then painted onto the substructure after which it is placed into the oven to be fired. When the firing is complete the veneer is smoothed with a special tool before glazing. Several glazes are available to choose from to make the tooth look natural. When the fabrication of the veneers is complete they are returned to the dentist. This process can take up to two weeks, at which point they are examined for color and fit and then permanently bonded to the front of the patient’s teeth. Located in West Allis, WI, Michael E. Flynn, DDS, and his talented team of dental care professionals proudly welcome patients from West Allis, Brookfield, Wauwatosa, and all Western Milwaukee communities. To learn more, or to schedule your next appointment, call Michael Flynn Dentistry today at 414-541-8250.